Shipping has begun for the long-awaited Momentum, Momentum INC, and Momentum Lite Smart Helmets. Sena has engineered this line of full face helmets from the ground up and for the first time riders will be able to hear our industry-leading technology the way it was meant to be heard, with the ideal integration of Sena's technology creating an unrivaled audio experience. The Momentum Smart Helmet series has begun shipping. The Series includes the Momentum with 8 Bluetooth connections, the Momentum Lite with 4 Bluetooth connections and the highly anticipated Momentum INC with Intelligent Noise Control technology and 8 Bluetooth connections. Momentum INC: Along with the aforementioned Momentum models, an initial limited batch of the long awaited Momentum INC (Intelligent noise control) helmet has also shipped! Using the same 20S feature set, the difference for the Momentum INC is the revolutionary integrated noise-canceling technology which still allow you to hear vital audio cues like sirens, traffic, and your RPMs. Simply toggle the "on" button and the built-in INC™ module is ready to go. The module analyzes sound information from an array of four networked microphones and adjusts in real time to phase out harmful high frequency wind noise. In addition to the INC mode, the helmet also features an Ambient Mode that can be easily switched on with a convenient button on the helmet's exterior, allowing you to hear clearly around you without removing your helmet. The Momentum INC will retail for $549. Each helmet within the Momentum series is DOT approved and aerodynamically designed from composite fiberglass shell with multi-density EPS for added protection in the case of impact. The helmets have an intricate ventilation system with chin and forehead air intakes, along with an exhaust port in the rear of the helmet to keep riders cool. The helmet's visors are scratch and UV resistant, pinlock ready (Max Vision 120), and feature a quick release system for ease of use. The helmets all include quick dry lining that's constructed with laser-cut foam and is removable and washable along with the chin curtain. The modern design full-face helmets are secured with a reinforced, nylon strap double d-ring retention system for a safe and comfortable fit. 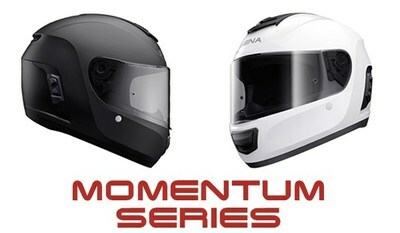 Please visit our YouTube Channel for more detailed information regarding the Momentum Smart helmet series. As this product line has just begun shipping, availability varies, please check with your local dealers to ensure whether or not they have the product in stock. Find a dealer near you or buy directly through Sena.